Power Lotto Wheeler supports Lotto, Powerball, and Keno game types from Pick 3 to Pick 10. There are over 400 wheeling systems provided to help you wheel up to 30 numbers. 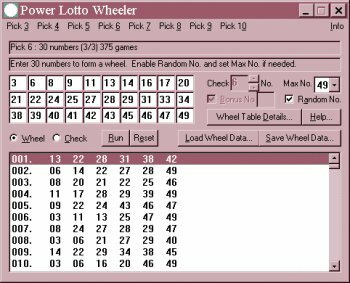 Features provided such as wheel table details, winners-check details, random numbers generation, and load and save functions for wheel data and winners-check result.